Kickserv’s signature capture allows you to collect signatures from your customers, whether live with a technician or electronically via email. The signature capture feature is available for estimates and invoices. 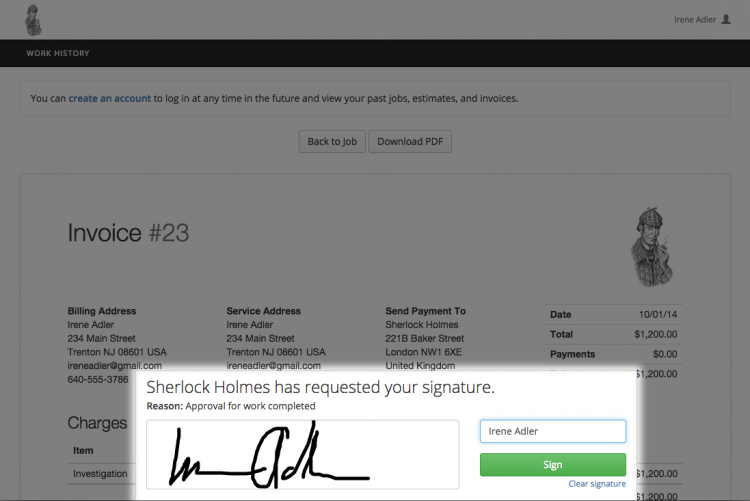 You can request a signature on estimates in two ways: live and via email. Live signatures can be collected by a technician or estimator while they are at the estimate appointment. Simply view the estimate, and press the “Collect live signature” button. The customer can use their finger or a stylus on touch devices or a mouse to sign in the box. Signatures on estimates can also be requested via email. While viewing the estimate, click the “Email” button and be sure to check the “Require signature upon estimate approval” checkbox. When your customer views the estimate, they will be asked for the signature to approve it. Invoice signatures differ from estimate signatures in one aspect: we require a reason for the invoice signature. Since the vast majority of estimate signature are for estimate approval, no reason is required there. But on invoices, you may wish to collect a signature after each major stage of the work is complete, or you may need one at the end of a job, to verify that the work has been done to the customer’s satisfaction. You can click the “Collect signature” button and choose “Collect live signature” to begin the process. At the prompt, fill out a reason for the signature, then click Next and pass the device to the customer. Your customer can then sign in the box to approve and pass the device back to you. Similar to estimates, you can click the “Email” button on an invoice to open the email form. Check the box to require a signature, then fill out the reason below. When your customer views the invoice, they will be prompted for their signature. When a customer views an estimate in the Customer Portal, they’ll be prompted for their signature as part of the approval process. When a customer views their invoice in the Customer Portal, they’ll be prompted to sign the invoice for approval. They’ll be shown the reason you requested the signature. Pending and finished signatures can be viewed at the bottom of estimate and invoice pages. Update: Signature can now be captured on a work order too! For business which use the work order as a place to verify approval for the work to be done (or what was completed), we have enabled the same experience as seen above from the work order page.